The Oddist is a 60/70-minute podcast focusing on the “odd” world in which we live. Every episode contains thirty minutes of news and happenings in the world, thirty minutes of a guest interview, (explained at the bottom of this page). Anyone and everyone can/might be interviewed on the show since everyone is odd in their own particular way. The first season began in March of 2008 and ran 12 shows. The Second season began in March of 2009 and ended in October of 2009 and ran 18 episodes. The 3rd season is tentatively set to begin in June of 2010. There are rumors that a new season is set to begin in 2013. Stay Tuned. The host of the show is John E.L. Tenney. His columns have been printed in magazines and newspapers world-wide, and he has lectured to numerous public and private schools, universities, organizations and clubs. He has been interviewed extensively on radio and television due to the fact that he has been actively involved in the field of paranormal/conspiratorial research for well-over a decade. Mentally he is about 12 years old. Emotionally he is a cripple. Well BB Guns. During the first season, and some of the second season after guests were interviewed they had the opportunity to shoot 5 shots from a Daisy BB Gun at a target. No reason, but I mean why not? No one shoots BB guns on the show anymore. The similarity that most podcasts share are that they are boring. Some person somewhere, talking about something. yawn. The Oddist is fun, weird, insightful and interesting. Every episode contains at least one thing that you’ll be using in conversations for the next week, if not for the rest of your life. What can I say I love Korean pop music and jazz. get used to it. 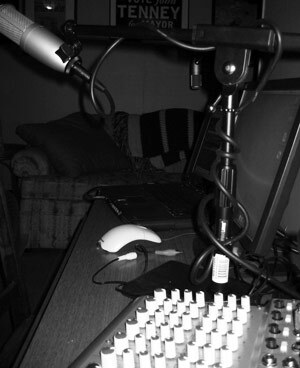 During the first season and a couple times during the second season guests during the second half of the podcast were interviewed in one of six styles. The type of interview was determined by the roll of a single die. Most of the time this is forgotten and everybody just gets drunk. 1. Waverism: The most important part in the conversational style of waverism is to create then break a deep rapport between the interviewer and interviewee. In the simplest of terms, Agree then Disagree. 2. Sousistic: The overwhelming realism of a situation is revealed after a considerable amount of intoxicating beverages have been consumed by, at least the interviewer. 3. Non-responsomatic: The interviewer shows little to no concern or interest with the guest. Uncomfortability and embarrassment are the likely outcome. 4. Subjugatory: The interviewee is treated as though they are completely uninteresting, therefore the interviewer talks and does not allow for two-sided conversation. 5. Adoritory: Great interviewers love their guests, this is one step further…true undying almost grotesque in its fullness “love”. 6. Kingadoltic: The father and innovator of multiple confusing styles of the interview is/has been/will be, Larry King. Good luck figuring out what is being discussed. Who the hell was Durgan? Sitting in during the news segment of the show, during the first season, was Durgan, intejecting comments and thoughts sometimes insightful sometimes not. Durgan was a co-host for the first 10 episodes but then the demands of the show and his life became to much to handle and he was fired. Who the hell were Alex and Sara Jean? Alex and Sara Jean were the grounding rods to John’s mentally unstable lightning during the second season.